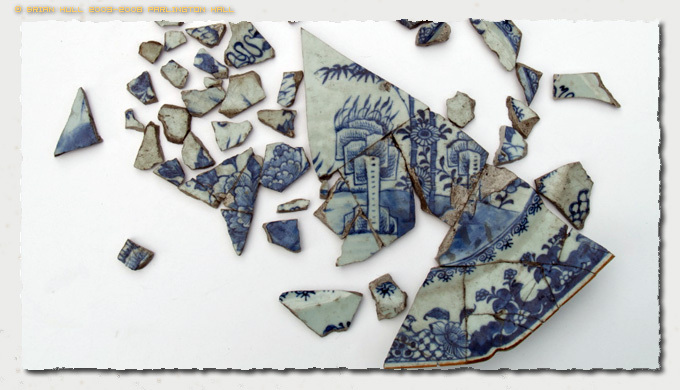 The above fragments of porcelain were discovered in the roadway on route to the site of the former lake which used to exist at the foot of the hillside known as Parlington Hollins, subsequent visits following heavy rainfall have uncovered further pieces. Following the discovery a trip was made to Lotherton Hall to view the collection of Gascoigne Armorial Porcelain Service held there, interestingly whilst the pattern on the fragments is clearly traditional Blue and White and not a bespoke design, the porcelain composition itself appears to be almost identical to that which comprises the Chinese service acquired by Sir Thomas Gascoigne in the 1770's. The gold edging and indents on the perimeter are a direct match for some of the pieces in the collection. Could it have been broken on route to a picnic at the lake? 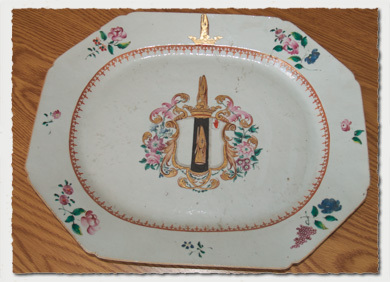 The base of the plate has a distinctive rough surface and is orange/yellow in colour, exactly the same as the armorial service. The above image is a recent photograph taken of one of the collection from Lotherton Hall of the Gascoigne Armorial Service. The plate found is of a simailar shape and size and can readily be seen to have similarities, although it is a Blue and white pattern. 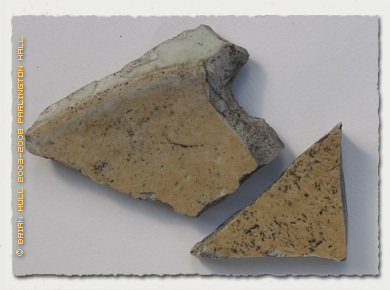 The edge of the plate has the same characteristic indent and the rear of the plate is the same ochre colour. Close to the location of the porcelain plate another find, again porcelain but from the lid of a tureen in a diferent style probably nineteenth century. 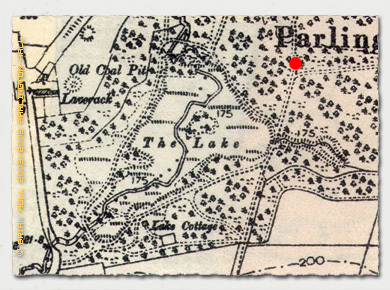 To quote from the Lotherton web site: The backbone of Lotherton's collection is still the Gascoigne bequest gathered here by the family, consisting of splendid furniture, silver, china, paintings, sculpture and textiles. This indigenous core has been enriched by gifts, bequests and purchases.